Following on from the comments on the North Yorkshire Ford A Series picture #5416. 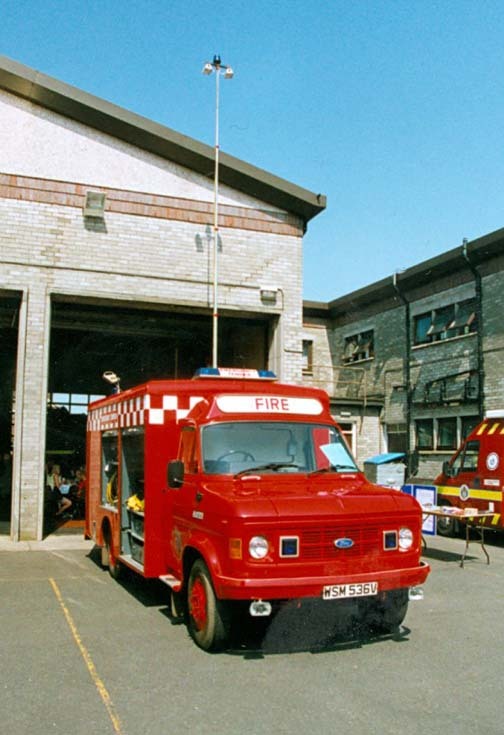 Here is ex Dumfries and Galloway Fire Brigade WSM 536V which was stationed at Newton Stewart and is now preserved in Scotland by Donald McCulloch. Photo taken at Dumfries open day. Nice one Paul and thanks for uploading these ! great appliance, not sure what it is but they had something about them that just made them right ! One has been preserved, and looks in very good condition...Grand. Very impressive lighting mast on this one. Just hope they remember to take it down before moving off. One of my lads decided to test the Stem-light on ours; he forgot he was parked under the appliance room rear canopy, elevate,crash,...Oops! Added by Brian Downes on 08 July 2009. It's the look of them. Ours had a lower roof, we reckoned we looked like Squad 51 from that American TV show 'Emergency!' that was showing at the time. Remember that? Yes i remember that Brian ! As you say, great little bit of kit only negative thing i remember is the 12 v electrics, North Yorks had the blue revolving beacon from them and replaced it with a strobe light certainly worked better ! Added by John Johnstone on 09 July 2009. The lighting mast was originally an aerial mast, but I added the accorn blue lamp which is powered by a slave battery and the 2 flood lamps are powered by the 110volt portable generator or the 110 volt on board generator. The only drawback with the mast is it is air operated by using a hand pump that slots on to the back bumper. Added by Donald McCulloch on 09 July 2009. Added by Brian Downes on 09 July 2009.